designation 1,1-thiobis (2-chloroethane) (chemical formula: Cl-CH2-CH2-S-CH2-CH2-Cl). Mustard gas has a number of other names by which it has been known over the years, including H, yprite, sulfur mustard and Kampstoff Lost. Because the impure substance is said to have an odor similar to that of mustard, garlic or horseradish, the name mustard gas is most commonly applied. However, in the pure form, mustard gas has neither color nor odor. The gas was used for the first time as an agent of chemical warfare during World War I, when it was distributed with devastating effect near Ypres in Flanders on July 12, 1917. The synthesis of mustard gas was reported much earlier than its first use as a chemical weapon. In 1860, Frederick Guthrie observed that when ethylene reacted with chlorine a substance was produced which, in small quantities, could produce toxic effects on the skin. Exposure to low concentrations of mustard gas classically causes the reddening and blistering of skin and epithelial tissue. On inhalation, the gas will cause the lining of the lungs to blister and leads to chronic respiratory impairment. Higher concentrations of mustard gas will attack the corneas of the eyes and eventually cause blindness. Exposure to mustard gas can lead to a slow and painful death and any moist area of the body is especially susceptible to its effects. The compound is only slightly soluble in water, but it undergoes a hydrolysis reaction liberating highly corrosive hydrochloric acid and several other vesicant intermediates, which are able to blister epithelial surfaces. Despite the ease of hydrolysis, mustard gas may be preserved underground in a solid form for up to ten years. The reason for this is that in an environment where the concentration of water is relatively low, the reaction pathway proceeds to form an intermediate known as thiodiglycol. In a low moisture environment, most of the water available at the solid surface is used in this reaction. Subsequently, another intermediate in the reaction pathway, a sulfonium ion, reacts with the thiodiglycol in the place of water. This reaction then creates stable, nonreactive sulfonium salts, which can act as a protective layer around the bulk of the solid mustard preventing further degradation. Mustard gas as a chemical weapon is a particularly deadly and debilitating poison and when it was first used in 1917, it could penetrate all the masks and protective materials that were available at that time. In more recent years, urethane was found to be resistant to mustard gas, and also has several other advantages for use in combat; urethane is tough, resistant to cuts and is stable at a wide range of temperatures. Detoxification procedures from mustard gas are difficult because of its insolubility and also because of the drastic effects it can have on lung epithelial tissue following inhalation. During World War I, physicians had no curative means of treating the victims of mustard gas exposure. The only method of detoxification that was known involved a rather extreme oxidation procedure using superchlorinated bleaches, such as 5% sodium hypochlorite. Today, several novel methods of detoxification have been developed to counter the effects of mustard gas and these include the use of sulphuramine solutions and magnesium monoperoxyphthalate. The most effective method to date employs peroxy acids, because they are able to react quickly with the mustard gas. Furthermore, the addition of a catalyst can speed up the detoxification reaction even more effectively. Although mustard gas has been shown to have long-term carcinogenic properties, it can also be used as an agent in the treatment of cancer. 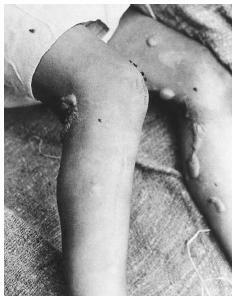 In 1919, it was observed that victims of mustard gas attack had a low white blood cell count and bone marrow aplasia (tissue growth failure). More detailed research in the years following 1946 showed that nitrogen mustards, which differ from traditional mustard gas, could reduce tumor growth in experimental mice by cross-linking DNA strands. It had been shown previously that the sensitivity of mouse bone marrow to mustard gas was similar to that of humans and more detailed research eventually led to successful clinical trials. Today, nitrogen mustards are part of the spectrum of substances used in modern anti-cancer chemotherapy. They are primarily used in the treatment of conditions such as Hodgkin's disease and cancers of the lymph glands. Devereaux, A., D. E. Amundson, J. S. Parrish, and A. A. Lazarus. "Vesicants and nerve agents in chemical warfare: Decontamination and treatment strategies for a changed world." Postgrad. Med. 1 (2002): 90–96. Evison, D., D. Hinsley, and P. Rice. "Chemical Weapons." BMJ 324 (2002): 332–335. Jones, G. B. "From mustard gas to medicines: the history of modern cancer chemotherapy" Chem. Herit. 15 (1998): 8–9; 40–2. United Kingdom National Archives Learning Curve. "Mustard gas." < http://www.spartacus.schoolnet.co.uk/FWWmustard.htm > (February 20, 2003).